An attractive shed in gardener’s green that will appear unobtrusive within your garden, blending into its natural surroundings. 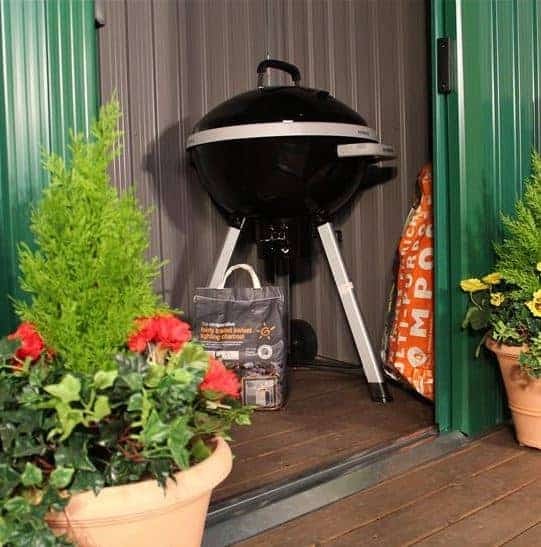 With a spacious interior accessed by large sliding doors, storing your outdoor and garden equipment couldn’t be easier. An excellent buy at this price too! This is a deluxe metal shed with double sliding doors giving our gardeners plenty of good access to all their gardening paraphernalia. Fire resistant and rustproof and with deep roll formed wall and roof panels it is extremely strong and sturdy. 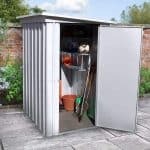 A perfect storage solution for smaller outdoor spaces and it is a handsome looking metal shed; no doubt this will be a great addition to your garden. 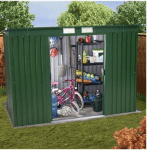 Whatever you have to store, be it bikes, gardening and outdoor equipment and furniture, this shed will more than accommodate the entire family’s storage needs. With a spacious interior it is possible to increase storage capacity with the addition of freestanding shelving and/or hooks for your smaller accessories and tools. The handy sliding doors ensure the shed takes up minimal space within your garden or outside space whilst ensuring everything is within easy reach from the outside. 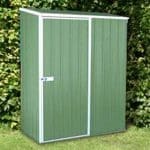 A great choice of shed if you require a storage solution that is unobtrusive within your garden due to blending into its natural surroundings. If you are currently looking at sheds to buy then you may be overwhelmed by the vast choice available to you. 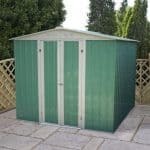 At whatshed.co.uk, our team look at features that may be of interest to you when you are deciding which shed or garden building suits your needs the best. Below we identify and discuss any advantages and interesting features of this particular model. Exterior: The strong steel exterior is fire resistant and rustproof, providing fantastic protection for your items, keeping them dry and secure from the elements. The attractive green colour enables the shed to blend into the natural surroundings of your garden, perfect or the smaller garden or if you wish the shed to be almost invincible within its environment. Interior: The interior had adequate floor space to enable you to store all of your outdoor and garden equipment, bikes, as well as smaller items such as tools and accessories. Freestanding shelving and drawers may be added internally to provide additional storage for your smaller items. Sliding doors: The large sliding doors provide a fantastic feature for this shed, opening to reveal an opening as wide as the whole front of the shed. Your items remain accessible at all times from the front of the shed. The wide opening is also useful for storing larger items easily. Security: Although the shed doesn’t come complete with security fittings of any kind, it is possible to add security measures of your own, including a padlock or similar device. This can be purchased independently at a modest price, giving you peace of mind that your items are protected at all times. 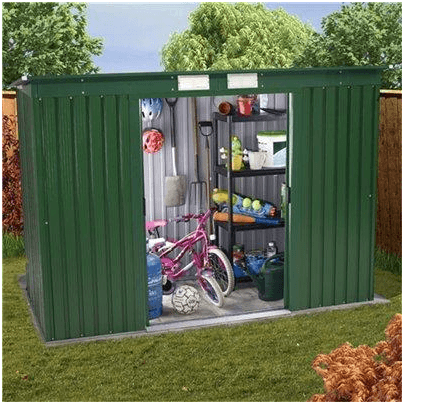 The BillyOh Sutton Pent Metal Shed: How easy to build? 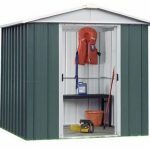 It is recommended that two people work together to assemble this shed due to the handling or steel panels and attaching the roof. A set of basic tools is required for assembly, however your package will contain all of the screws, nails and other fixings you will require during construction of your new shed, as well all the necessary panels and roof material. An instruction manual is provided with clear instructions, both written and in the form of easy-to-follow diagrams. We expect that assembly of this particular model could be completed within a couple of hours. 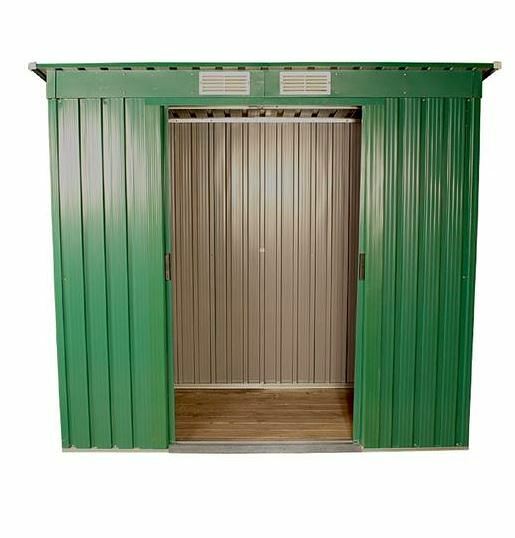 The BillyOh Sutton Pent Metal Shed: What is the overall quality like? 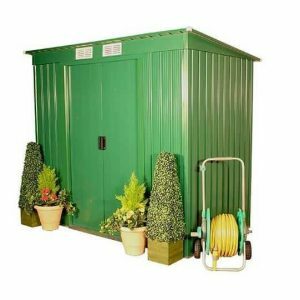 BillyOh are a company that provides high quality sheds, garden buildings and storage solutions for gardens and exterior spaces. 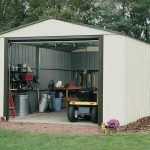 If you are looking for a strong, durable shed that will provide protection for your items, keeping them safe from the elements, then this deluxe metal shed may be just what you are looking for. The front vents keep your items inside cool and dry, as well as preventing mould and damp from forming. The steel panels that the shed is constructed out of are both fire resistant and rustproof meaning your shed and the contents inside will still be standing strong whatever life may throw at them. Due to the construction materials, this particular model is virtually maintenance free. If at any point it should require a clean then a simple hose down with water or spot clean using a sponge should suffice in helping it stay looking its best at all times. Create a relaxing environment in which you can enjoy the beauty of your garden and free up space with the BillyOh Sutton Pent metal shed. At the lower end of the price range for similar specification sheds, this deluxe metal shed offer year-round protection for your items, offering great value for money. If you are looking for a simple storage solution for your outdoor equipment and tools then this could be the right choice for you.